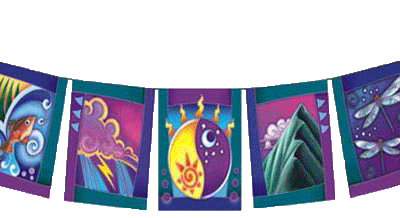 The Feng Shui flags represent the 5 elements in balance, inviting positive chi flow to any room or house. Gray/Metal: helpful people. Blue/Water: career, energy flow. Yellow/Earth: health, center. Green/Wood: growth, family. Red/Fire: illumination, fame. Purple: prosperity.